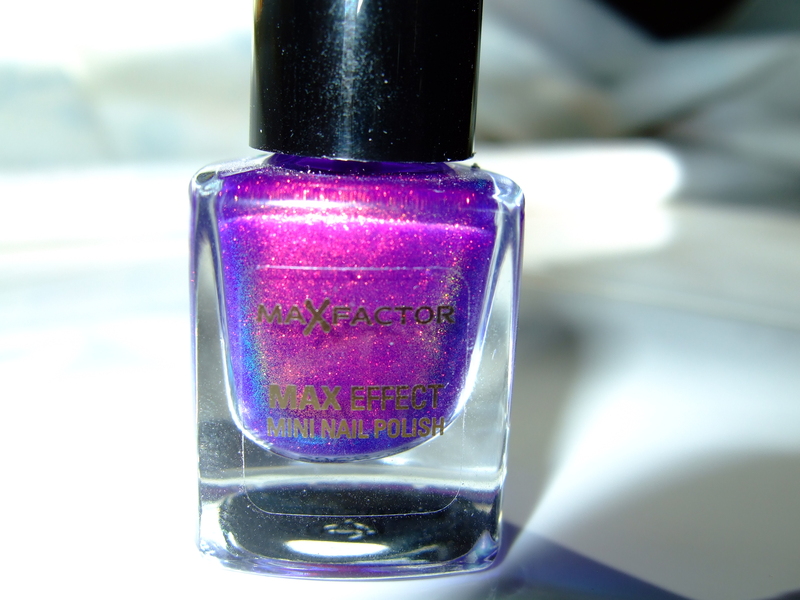 A long time ago, a blogger friend of mine from Wales found out she had Max Factor Fantasy Fire at her local drugstore. She offered the community a swap or custom purchase for fun. We swapped and had a blast. April is a friend of mine now, we had so much fun. She loves pets and has a black cat, who is her greatest love. After the swap, I never took the pictures of it and blogged it before due to weather. Well guess what? Today was sunny, so I can finally take pictures. 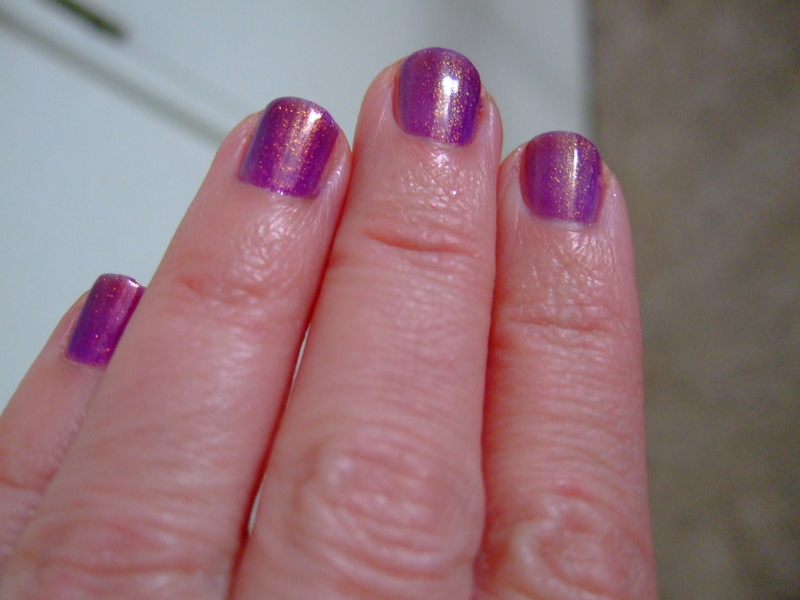 This is definitely not close to Clarins 230, which is more of a warm purple. 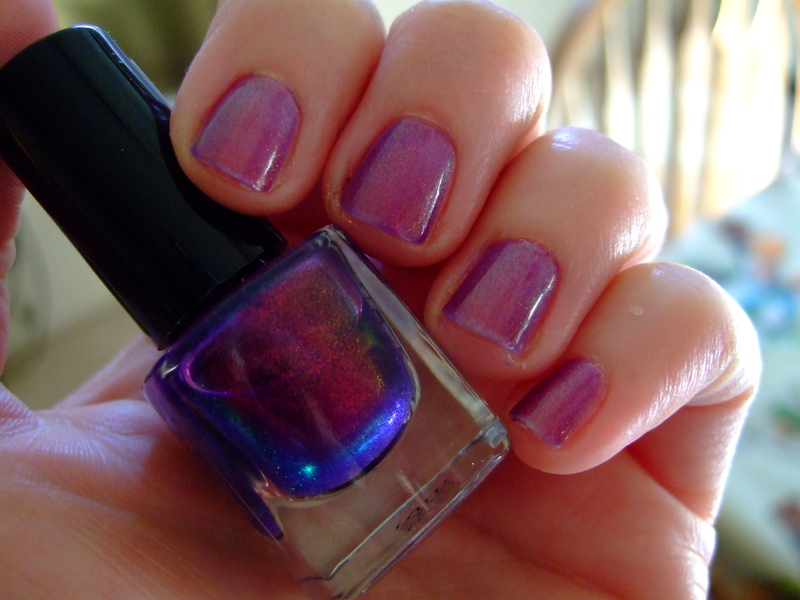 Fantasy Fire is a lot cooler, and a smidge darker. 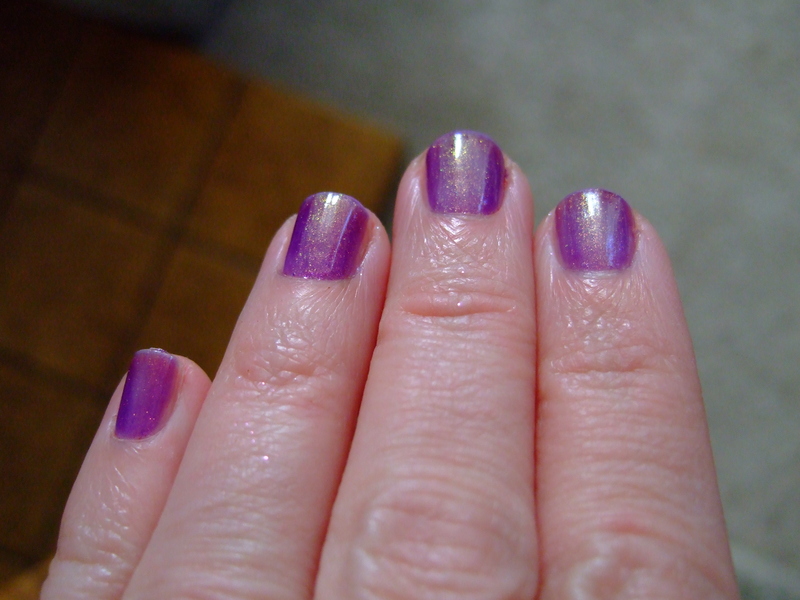 This goes on very dark purple, yet sheer, on the first coat. 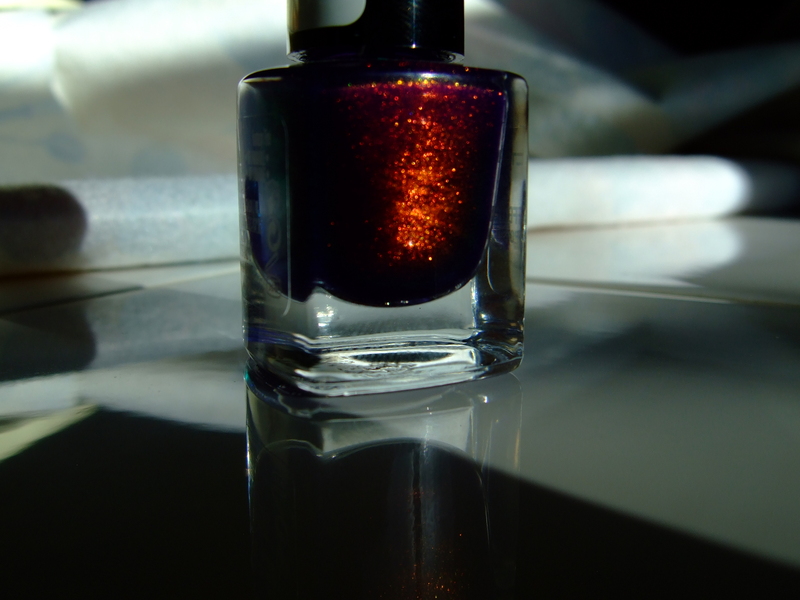 The second, while still sheer, offers a very strong duochrome to bronze and also to green. 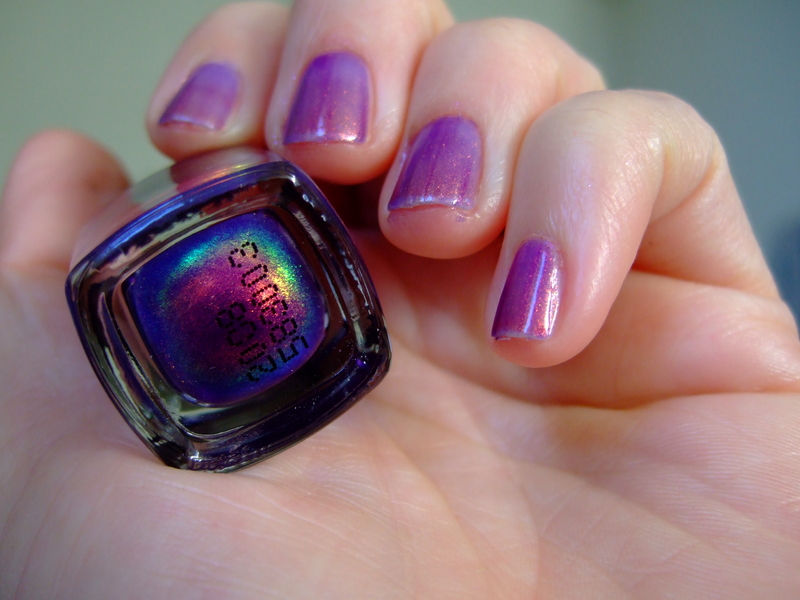 Also, without seeing the duochrome flash, you go from dark purple with a lighter pink shine within just kicking around with no strong light. Thank you, April. 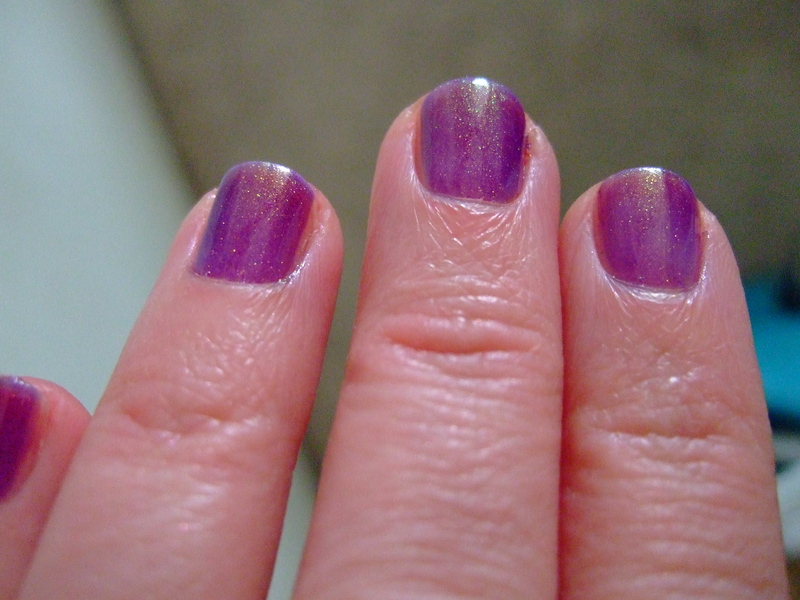 I took lots of pictures here to do justice to the color, which is lots of fun. The bottle is a tiny one, not a mini but probably smaller than a regular OPI bottle by at least a half, maybe one third of the size. Also I had a little chuckle looking at the bottle. The product is supposed to be made in France. I don’t know who made the bottle. But there is an international symbol on the bottle with a garbage can and “36M” by the garbage, indicating you are supposed to throw it away after “expiring” in 36 months. Ha! So funny. Tell any nail collector to throw away a bottle of nail color because it “expired” and you will either get a 10 minute lecture or a simple shake and change of subject. I hope the pictures do Fantasy Fire justice. 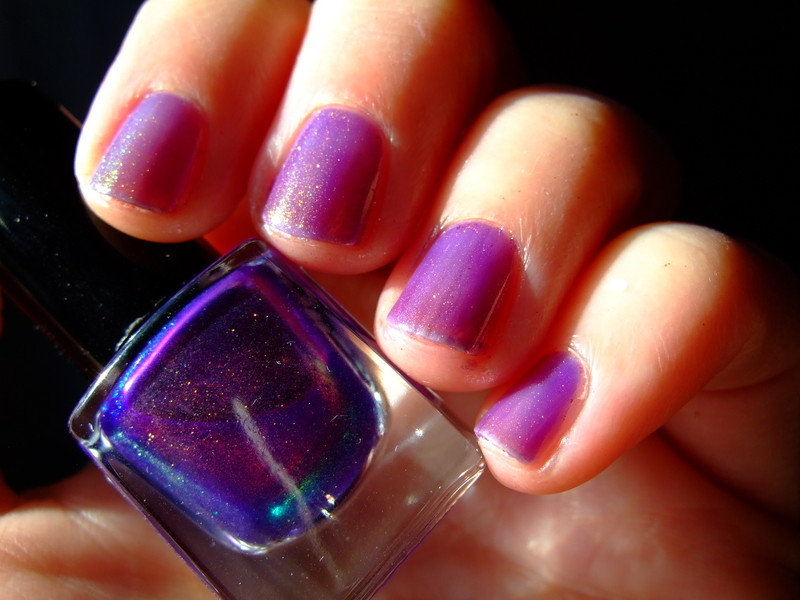 These above show Fantasy Fire in bright or indirect light on nails, attempting to show the pink shine in light and also a little bit of the more clear/gelee look of the base. 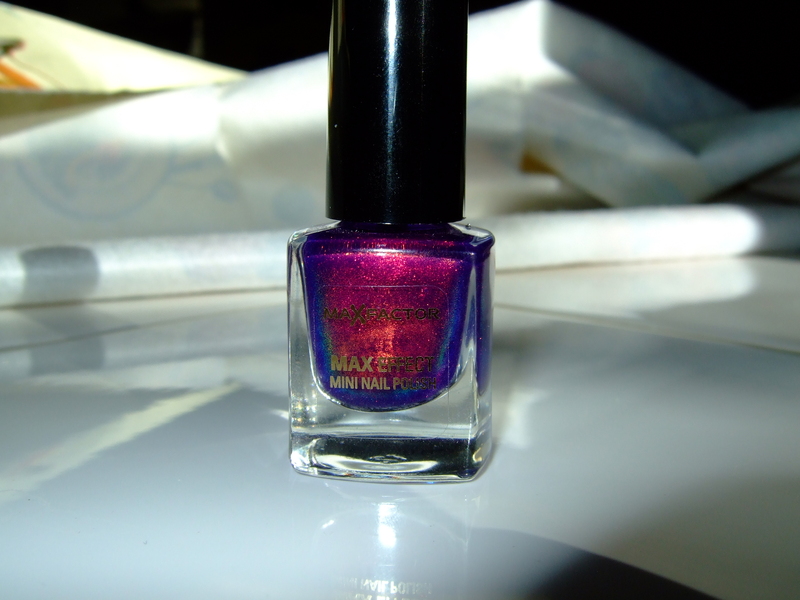 These below show bottle pictures of Fantasy Fire in different lights. Look for the “36M” written on the back of the label. teeny bottle. Note the expiration date! The last pictures were really hard to see, but it was my personal effort to show the bronze/gold and then the green (bug’s eye or wing look) of the duochrome shine. Hope you enjoyed your pictures of Fantasy Fire. If you would like a bottle, the best thing to do is network on your internet communities and hopefully a bottle will come your way.